The amazing view from the top of the ridge, looking back toward Valbonë Valley. 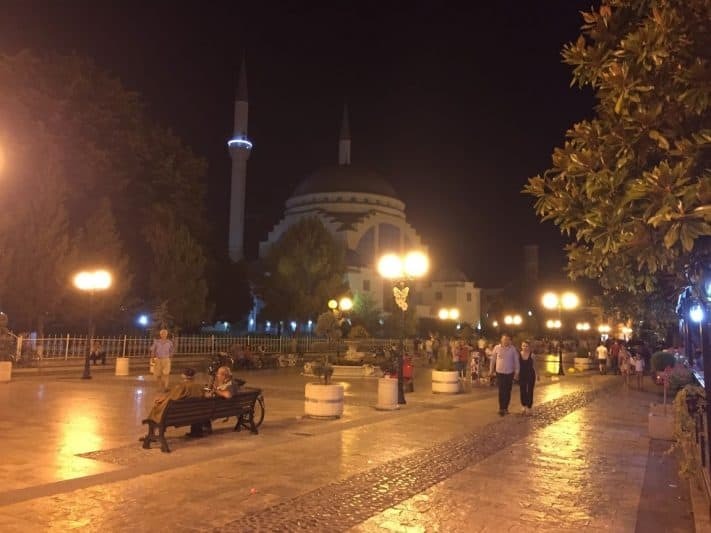 Pedestrians on Kolë Idromeno Street in Shkodër at night, with Ebu Bekr Mosque in the background. The sun had set behind the hills overlooking the river Bojana, and its slow-flowing waters reflected the purple sky above. The imposing Rozafa Castle crowned a hill to my left, and below it, stray cats and dogs scavenged for food amidst piles of garbage. Small, ramshackle, houses lined the dusty road leading up to the castle, and every so often a child would come riding down the hill on a bike, sometimes barefoot. Across the street, a horse, unbridled, wandered between an overgrown front yard and a neighboring gas station. Well, here I am, I thought as I walked along the main thoroughfare leading into the city of Shkodër. This is Albania. I was supposed to get here by car, but the taxi driver in Montenegro who had promised me that he would drive me to the city got cold feet. One of the family kittens eyes my tea with interest in Arben's mountain guesthouse in Valbonë. With a line of cars stretching for half a kilometer toward the border crossing and cows and goats being led through customs, he refused to go any further, yet insisted that I pay him the previously agreed upon price in full anyway. After a bit of haggling I reluctantly marched through customs control, and after realizing that there was no public transportation to be seen on the other side, I sat down, stuck out my hitchhiker’s thumb, and waited. Two rides later, darkness was setting in, but I still needed one more ride to get into the center of the city. I was beginning to get worried. Passers-by were giving me strange looks, and the scavenging dogs were starting to growl at me. 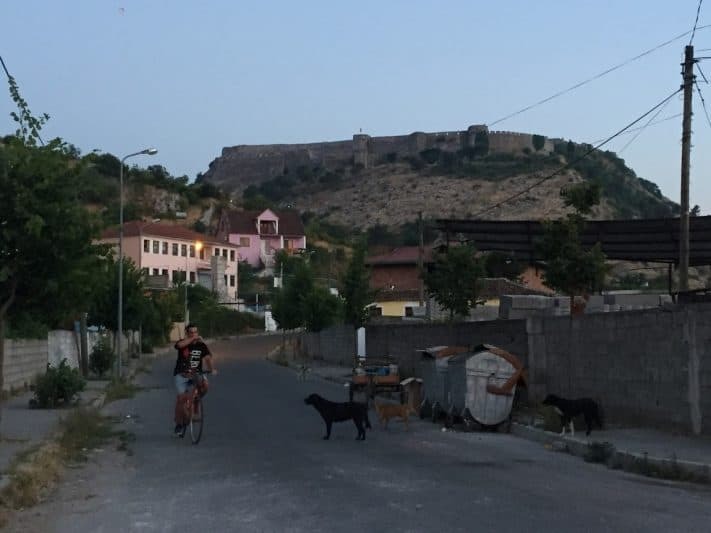 Then, a boy no older than twelve rode up to me on his bike from the direction of the castle, stopped, and with an obvious look of concern on his face, started asking me questions in Albanian. Sharp peaks line the road leading into Valbonë Valley in the Albanian Alps. Michal Kranz photos. I could tell by his hand gestures that he was asking me what I was doing. “Car,” I told him, motioning down the road with my thumb. “Car to Shkodër.” The boy’s brow furrowed. He looked me up and down, stared at me as if I had just fallen out of the sky, and pedaled away on his bike shaking his head. My stomach dropped. For the first time on my trip through the Balkans, I genuinely felt like I should not be where I was. What was I, a young, eager American right out of college, doing in this obscure corner of Europe? Had I made a terrible mistake? Then, to my amazement, a red car pulled up beside me. It was blasting aggressive techno and sputtering as it decelerated. Through the window, I could see a young Albanian man no older than thirty who looked like he had just stepped out of a nightclub. His smile was wider than the spoiler on the back of his car. “Let’s go!” he said in English as he motioned towards his car. Kolë Idromeno Street, the main pedestrian drag, in Shkodër, with Ebu Bekr Mosque in the background. Immensely relieved, I sprinted the ten feet toward his door, threw my things in, and jumped in myself. As we sped away, I knew that everything would be alright and that my previous paranoia had been unfounded. My adventure would wind on. 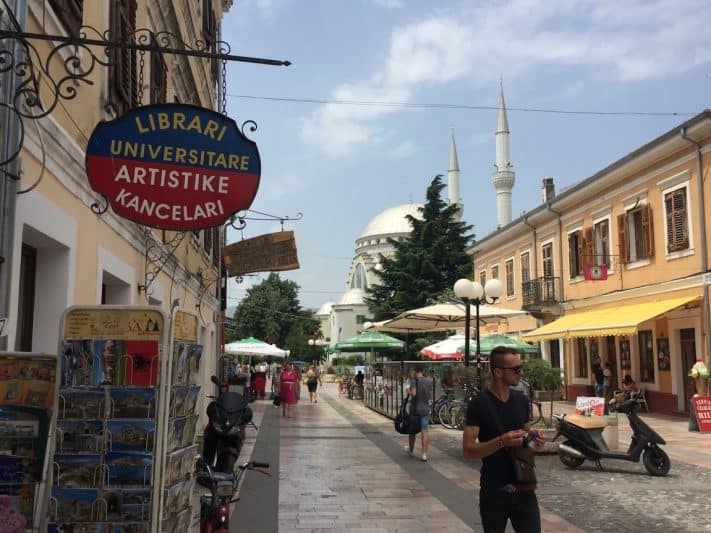 My club-hopping friend dropped me off near the center of Shkodër, in an area where modern storefronts mixed with more traditional street stands along pedestrian-only walkways. The central district was bustling with young people who had congregated in front of important civic buildings to watch coverage of the Albanian parliamentary elections – more often than not though, many were more concerned with flirting, drinking, and socializing than with the political developments being projected onto screens in front of them. As I walked further I passed several churches and mosques on my way to my hostel, and curiously, each one looked brand new. Much later I found out that this was due to Albania’s fraught 20th century history – after World War II, the country had endured one of the most repressive communist regimes in Europe under the thumb of dictator Enver Hoxha, who’s extreme anti-religious ideology had led to the destruction of many religious buildings in Albania during the Cold War. Theth's main Catholic church, surrounded by grazing sheep. and is still a nation in flux – its political and economic environment remains fraught with corruption, and most who attain a higher level of education leave the country. Shkodër itself is the northernmost major city in Albania, and lies in what I’ve been told anecdotally is the poorest part of the country. It is, however, an ancient city that was first settled by the ancient Illyrians, the ancestors of modern Albanians, and went on to become an important Roman and Ottoman outpost. The Rozafa Castle that I passed on my way into town serves as an impressive testament to this long history, as do the cobblestone streets and idiosyncratic houses in the city center. However, the city’s centerpiece, the Ebu Bekr Mosque, was entirely renovated and restored in the '90s and stands in sharp contrast to its timeworn surroundings. The hilltop Rozafa Castle stands in sharp contrast to the unpolished outskirts of Shkodër below. Unfortunately, I did not have much time to spend in Shkodër, and got up bright and early the next morning to embark to my next destination: a trip into the mountains. Whenever I travel internationally, I like to get my dose of nature in wherever I can. And in Albania, the pickings are plentiful. 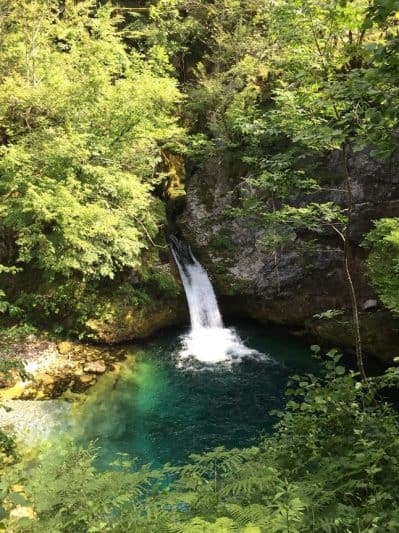 After taking a minibus to Lake Koman, a reservoir in the Albanian hinterlands, my group took a ferry through the glorious, white limestone canyons that the lake waters flow through. I got on another minibus on the other side of the lake, and departed for the village of Valbonë, hidden deep amid Albania’s mountain passes. 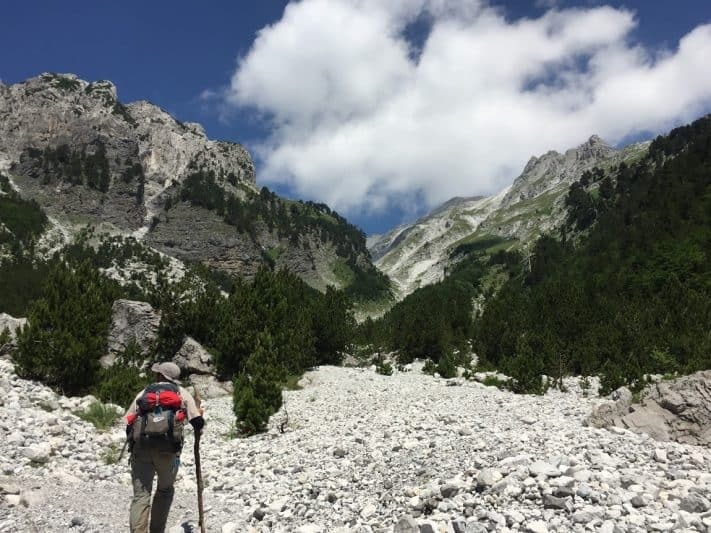 Before long, I found myself in the midst of the stunning Albanian Alps, also known as the Accursed Mountains, which are named so not without reason. Although this patch of mountains that sits along the borders of Albania, Montenegro, and Kosovo is not particularly tall by European standards (around 8,000 feet on average), they are stunningly steep and rugged. The fairytale-like Blue Eye near Grunas, south of Theth. Intimidating spires and ridges tower over both sides the road into Valbonë, with pines and cypresses clinging to whatever surfaces they can find. I caught glimpses of the stream flowing through the valley to our right, its waters a brilliant turquoise color. I was traveling with Claudio, a quirky Uruguayan software engineer whom I met back at the hostel in Shkodër, and both of us had arrived in northern Albania from opposite sides of the Balkans. My hiking partner Claudio Perrone as we worked our way upward. 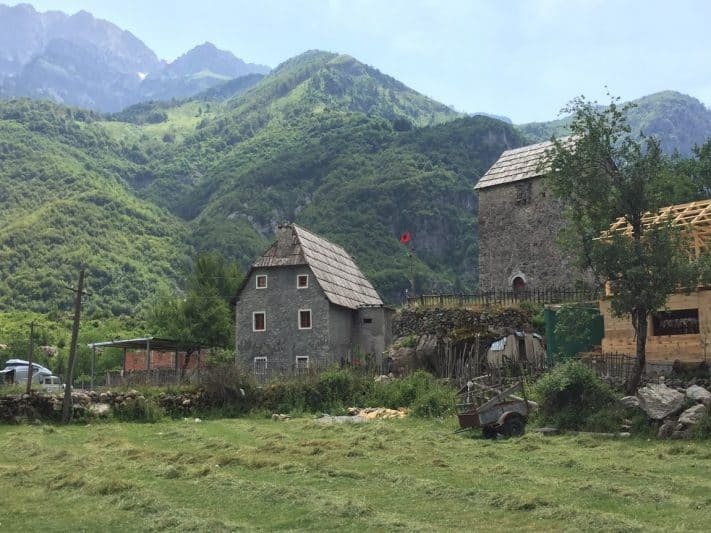 Our driver was a Valbonë native named Arben, and once we reached the end of the road, he offered us a stay at his home and guesthouse for 20 euros a night – homemade breakfast, lunch, and dinner included. That night, we ate a freshly-caught fish dinner outside with Arben’s family of four on the half-finished patio as crickets chirped all around us. Arben’s wife spoke better English than he did, and we soon got to talking about life in the mountains, Albanian culture, and eventually the country’s place in Europe and the world. Old mills in the center of Theth, with the Albanian Alps in the background. It was hard to challenge her point of view – the mountains provided a buffer of tranquility that the trials of the outside world could barely touch. Perhaps the most scenic playground I have ever seen. Located at the start of the Valbonë Pass hiking trail in Rrogam, near Valbonë. The next day, Claudio and I left the warmth of Arben’s household and descended even deeper into this natural buffer. 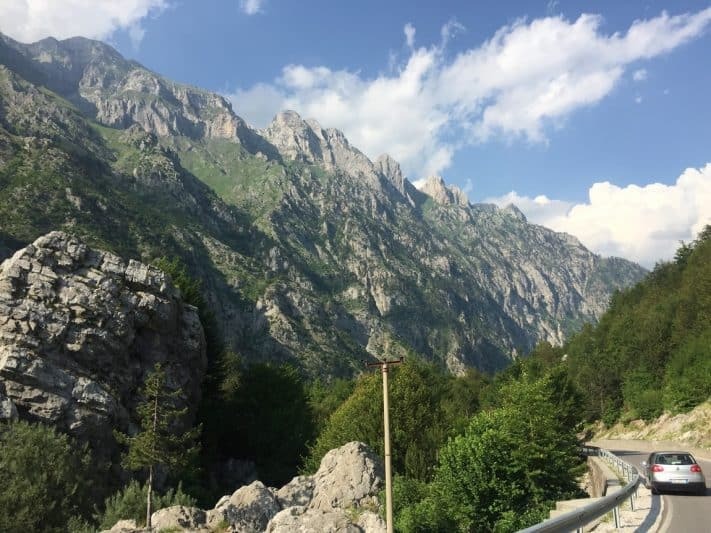 Starting from the village of Rrogam where the paved road came to an end, we climbed up rock walls and limestone peaks that jutted out into the sky at ridiculous angles toward Valbonë Pass. Our destination – the village of Theth, which was supposedly even more beautiful than Valbonë. After getting treated to unreal panoramic views over much of the jagged mountain range from the top of the pass, we descended into Theth, almost eight hours after leaving the valley on the other side. Unlike Valbonë, Theth was more than just a collection of houses – it was teeming with life. Children and their fathers shepherded sheep and cattle into pens and young men rode horses along the village’s main gravel road. A soccer game was underway on the grassy field next to Theth’s main church. And all of it lay in a narrow valley between several incredible mountain massifs that hemmed it in from the outside world. Claudio and I spent two nights in Theth, hiking up to waterfalls and vistas further down the valley, pleasantly immersed in the serenity of this mountain refuge. Although pastoralism continues to flourish here, the main sources of revenue in Theth are tourists like us, for whom amenities here seem dirt cheap, but whose money goes a long way for locals. 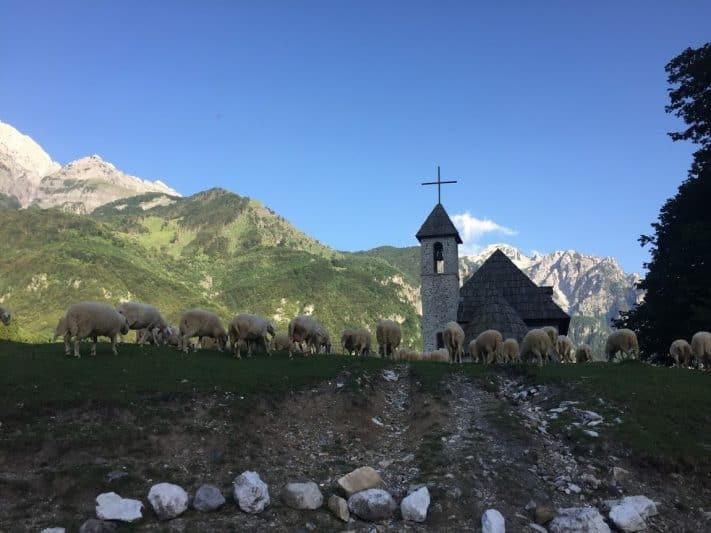 That’s because these mountain valleys had remained inaccessible to mass transit for centuries, and although most Albanians including those in Valbonë converted to Islam under the Ottoman Empire, Theth has remained Catholic due to its isolation. To this day, no paved roads lead into the valley, giving people here a remarkable degree of self-determination and forcing them to be interdependent upon one another. And even though things are hard in Albania, the tourist economy in Theth has caused everyone’s boat to rise. 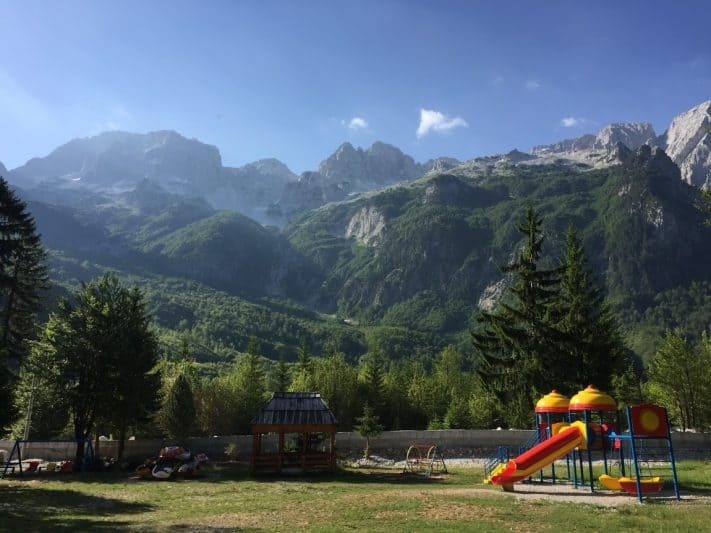 Rather than focusing on the troubles that continue to challenge Albanian society, the people of Theth and the Albanian Alps are content with enjoying the aesthetic and economic gifts their environment has brought them, just as they have for hundreds of years. 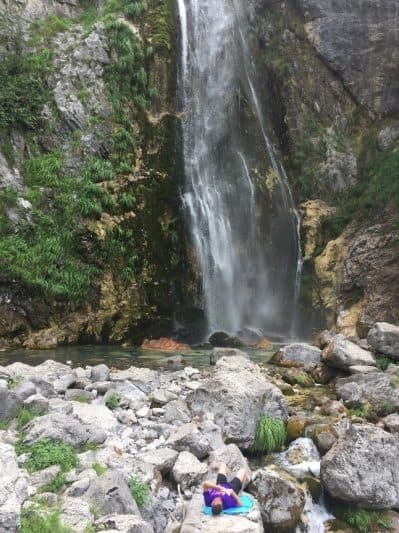 When the time came to leave Theth and head back to Shkodër, Claudio, I and other tourists boarded a bright orange minibus and headed up a steep gravel road. The road climbed up a steep mountainside and included innumerable switchbacks, but the higher we got, the more of the beautiful Valley of Theth we could make out through the forest of beech trees. As I thought back to my somewhat tumultuous entrance into this country, I was amazed at how much my own perception of Albania had changed. As we passed various abandoned lodges, an Albanian man behind me explained that many of them were efforts by the Albanian communist governments to build vacation resorts for workers. He also pointed out an old communist hotel that had been built to house Party members vacationing in Theth – however this time around, when we drove by the old hotel, a big brown cow triumphantly sat amid its decaying wooden walls. Uncaring, unbothered, and content, it sat staring at us from the ruins of a building that had been built by a regime that had ravaged the entire country. Like the people of Albanian, it too had proudly reclaimed its rightful place in the world – and was doing its best to make the most of it all.